There's trouble once again in the land of Oz! The mischievous boy Kiki Aru has discovered a magical word--Pyrzqxgl--can transform him and anyone else into whatever Kiki demands. Worse yet, Kiki has been recruited by the villainous Nome King in his latest attempt to get revenge on Princess Ozma and all her friends. While Ozma's court plans a spectacular celebration for her birthday, Dorothy and the Wizard set out with the Cowardly Lion and the Hungry Tiger to find a gift for their beloved princess. But in the Forest of Gugu they become entangled in the wicked plans and magical transformations of Kiki and the Nome King. Can Dorothy and the Wizard stop the evil-doers before they conquer Oz? Or will Kiki's incredible powers finally give the Nome King the revenge he has craved for so long? This deluxe reproduction of the rare first edition features all twelve of Oz artist John R. Neill's beautiful color plates, along with his nearly one hundred black-and-white drawings, making this the perfect present for Oz fans old and new. There's trouble once again in the land of Oz! A mischievous boy named Kiki Aru has discovered a magical word--Pyrxqzgl--that can transform him and anyone else into whatever Kiki demands. Worse yet, he has been recruited by the villainous Nome King in his latest attempt to get revenge on Princess Ozma and all her friends. Can Dorothy and the Wizard stop the evil-doers before they conquer Oz? This deluxe edition features the complete original text, color plates, and black-and-white drawings. 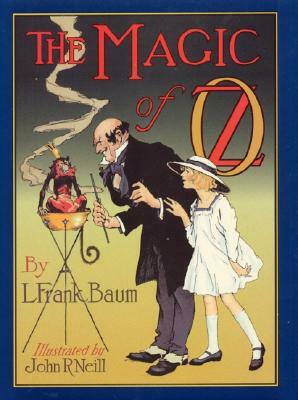 L. Frank Baum (1856-1919) published The Wonderful Wizard of Oz in 1900 and received enormous, immediate success. Baum went on to write seventeen additional novels in the Oz series. Today, he is considered the father of the American fairy tale. His stories inspired the 1939 classic film The Wizard of Oz, one of the most widely viewed movies of all time. Michael Sieben is a professional designer and illustrator, primarily within the sub-culture of skateboarding, whose work has been exhibited and reviewed worldwide as well as featured in numerous illustration anthologies. He is a staff writer and illustrator for Thrasher magazine, and a weekly columnist for VICE.com. He is also a founding member of Okay Mountain Gallery and Collective in Austin, Texas, as well as the cofounder of Roger Skateboards. The author of There's Nothing Wrong with You (Hopefully), he lives and works in Austin. John R. Neill was born in Philadelphia in 1877. In 1904, at the age of twenty-six, Neill received his first major book assignment, as illustrator for The Marvelous Land of Oz. From then until his death in 1943, Neill would illustrate over forty Oz books, including three he wrote himself. Today, his fabulous illustrations are synonymous with Oz. Peter Glassman is the owner of Books of Wonder, the New York City bookstore and publisher specializing in new and old imaginative books for children. He is also the editor of the Books of Wonder Classics, a series of deluxe facsimiles and newly illustrated editions of timeless tales. And he is the author of The Wizard Next Door, illustrated by Steven Kellogg. Mr. Glassman lives in New York City.